Uncle Tree made a play to get close, but he didn’t pass Mum’s security check. The babes hesitated and peeked, but followed Mum thereafter. 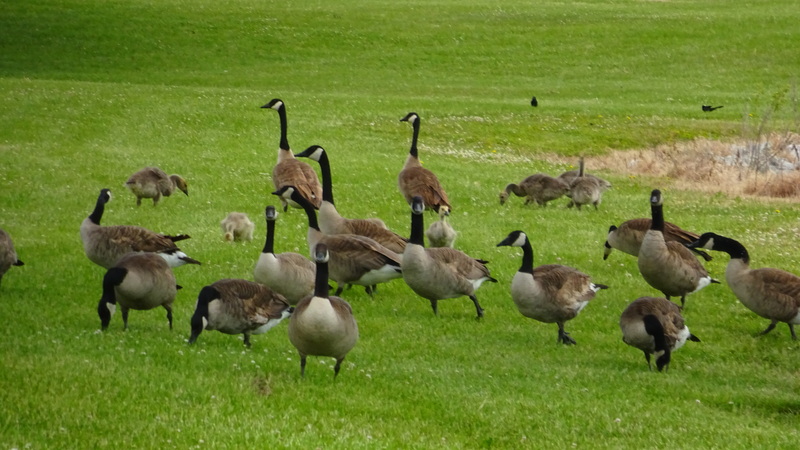 Ganders gallantly stood their ground for grazing hungry goslings. In the meanwhile, Mum taught impromptu getaway maneuvers. 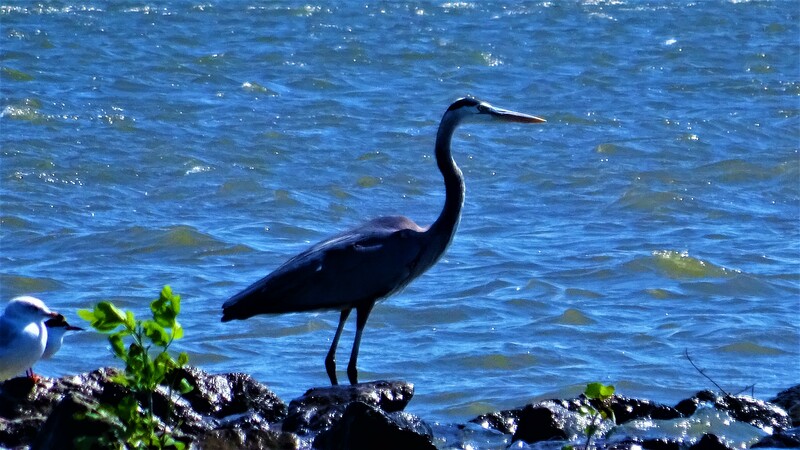 From heron out, I declare — birds must stand still when posing! Okay, besides this guy, who’s got the gull to oppose me? That’s what I thought, good gully. 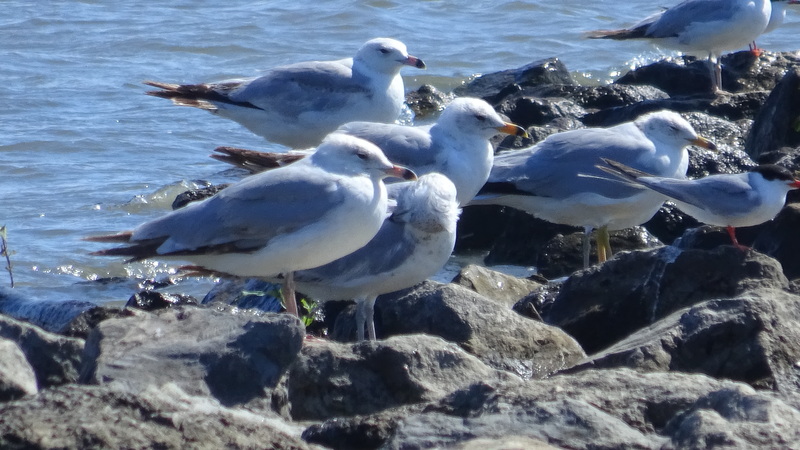 In the spring, we get seagulls before the big Nor’easter storms. It’s odd to see them in the mountains. Great post! I wanted to scroll down in a hurry to see your next photo and quip. 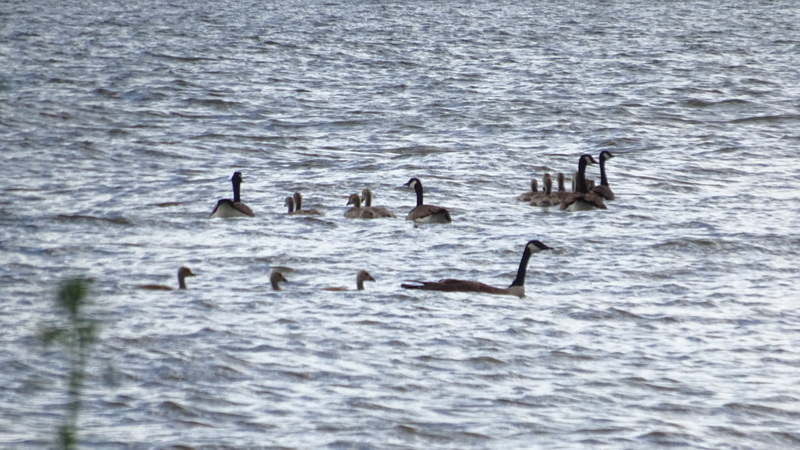 I’m patiently biding my time ’til the goslings and ducklings are in my neck of the woods. The camera will be clicking away as they all run this way and that … 1/4 of the photos will come out, and the rest, as you know, are just a blur. I’m looking forward to it because gulls just wanna have fun! These pics were taken back in June, Lloyd. 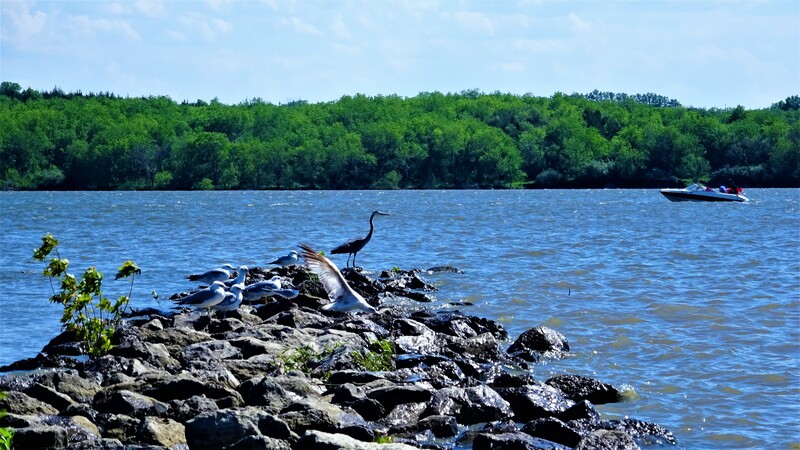 on the biggest man-made mud-hole around here — Branched Oak Lake. LoL! Thank you, Linda! 🙂 This bud’s for you. Hey Uncle Tree, I got the warm fuzzies just looking at those little darlings. Well…? Thank you! 😉 Smirk or smile, I’ll take it. 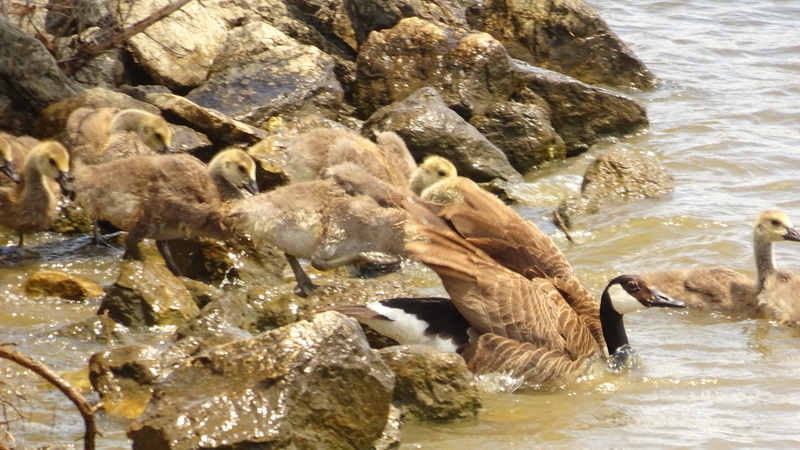 I got behind in Reader (two days) … fuzzy goslings and cheeky waterfowl are delightful interludes. Ah! I’m doing my job then. 🙂 Thanks again, my friend! Indeed you are Uncle Tree. Keep ’em coming’! Awww…thank you, Virginia! 🙂 Glad you like my hot shots. what a fun post and gorgeous shots. Thank you, K! 🙂 Glad you liked. Thank you much, Remrov! 🙂 They are very adorable. ahhh…there it is looking so pretty U-shaped by Lincoln…. Branched Oak Lake might look prettier on the map than it really is, George. These things happen. The best thing about it for me? It’s only a 15 minute drive away our house. The photos are really beautiful. And your play of words is fun. Almost as if the birds understood them….. Thank you kindly, Trish! 🙂 Good to know you liked this one. Thank you so much, angelbeam! 🙂 Glad you enjoyed my silliness. 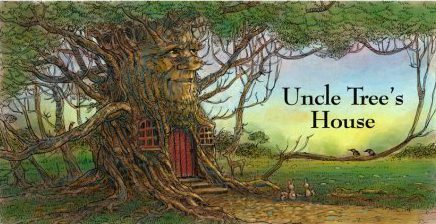 Uncle Tree figures most critters understand him and see his true manliness as safe and harmless. Very funny post! 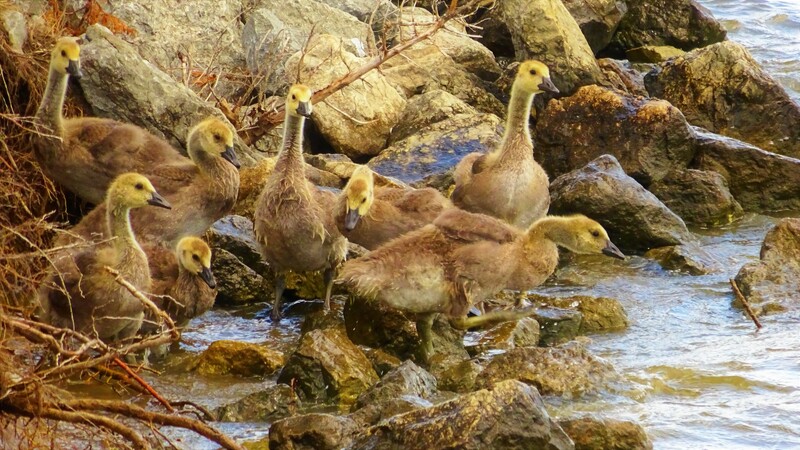 The goslings were so cute. I felt joyful after reading it. That’s good to hear! 🙂 Thank you so much! Thank you kindly, Margaret! 🙂 Glad to see you like these. I absolutely love your photos! Please keep them coming!